Striking and unusual in appearance, the birdlike F-117A Nighthawk is the world's first aircraft designed to make full use of stealth technology. Conceived and designed in just 31 months at the Lockheed Advanced Development Projects "Skunk Works" in Burbank, California, the Nighthawk was built for the United States Air Force between 1982 and 1990. The single-seat, twin-engine F-117 was the only U.S. or coalition aircraft to strike targets in downtown Baghdad during the Persian Gulf War. Both the air force and Lockheed are understandably reticent regarding the specific stealth technologies that make the Nighthawk virtually invisible to radar. However, it appears that the plane's distinctive shape serves to deflect radar waves, and that the materials used in building the craft absorb electromagnetic energy. As befits an extraordinary aircraft, even the story of its birth is something of a saga: from the initial production decision in 1978 to the first test flight on June 18, 1981 was less than three years, lightning-quick for an undertaking of such magnitude. The speed of production has been credited not only to the engineers at the "Skunk Works," but also to the management team at the Aeronautical Systems Center at Wright-Patterson Air Force Base in Ohio. The F-117A was not an aircraft the United States was inclined to share, even with allies, and therefore the only F-117A unit in the world is the 49th Fighter Wing (formerly the 4450th Tactical Group) at Holloman Air Force Base in New Mexico. Designed to deliver laser-guided weapons against critical targets, the F-117A has quadruple redundant fly-by-wire controls, and is equipped with a variety of sophisticated navigation and attack systems integrated into its digital avionics suite. Capable of being refueled in the air, the F-117A flew 18.5 hours nonstop from Holloman to Kuwait during Operation Desert Storm in 1991, setting a record for single-seat fighters. The aircraft was also deployed in Operation Allied Force in 1999, when it led the first North Atlantic Treaty Organization (NATO) strike against Yugoslavia on March 24. Additionally, the Nighthawk was selected to strike targets in downtown Baghdad in Operation Iraqi Freedom in 2003, not only because its invisibility to radar made it the safest craft to use, but also because its extraordinary accuracy made it capable of performing its job with minimal harm to innocent bystanders. Aronstein, David C., and Albert C. Piccirillo. 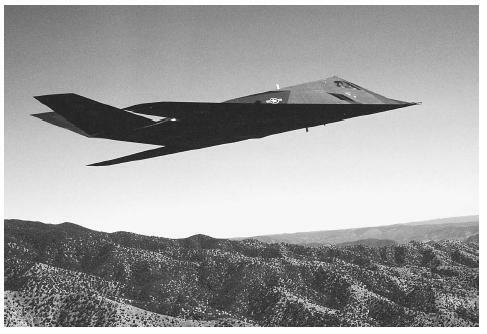 Have Blue and the F-117A: Evolution of the "Stealth Fighter". Reston, VA: American Institute of Aeronautics and Astronautics, 1997. Lake, Jon. Jane's How to Fly and Fight in the F-117A Stealth Fighter. London: HarperCollins Publishers, 1997. Macy, Robert, and Melinda Macy. Destination Baghdad: The Story of the F-117A Stealth Fighter, the Plane Credited with Ripping out the Eyes and the Heart of the Iraqi War Machine, as Told by the Pilots who Flew the Most Dangerous Missions of Operation Desert Storm. Las Vegas, NV: M&M Graphics, 1991. F-117A Nighthawk. United States Air Force. < http://www.af.mil/news/factsheets/F_117A_Nighthawk.html > (March 8, 2003). An F-117A Nighthawk Stealth fighter flies over the New Mexico desert during a training mission.